WASHINGTON — Moderate Republican U.S. Senator from South Carolina, Lindsey Graham, said that if the Republican Party overuses the Benghazi revelations, it could backfire come Election Day this November. 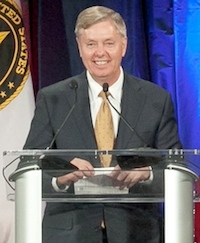 Reuters reported that Graham told CBS’ Face the Nation, “If we’re playing politics with Benghazi, we’ll get burned.” Lindsey is facing re-election this midterm election cycle. The Benghazi terrorist attacks on September 11, 2012, left four Americans dead and included the U.S. Ambassador to Libya, J. Christopher Stevens. A recent Freedom of Information Act (FOIA) request was granted to the watchdog group Judicial Watch, which revealed that Obama administration officials coordinated the effort to cover-up the reasons behind the attack. Initially, the administration blamed an amateur video for causing demonstrations that led to the attack on the U.S. consulate in Benghazi, Libya. However, that narrative was proven false after other information arose. AIM’s own Citizens’ Commission on Benghazi revealed that the Obama administration refused to negotiate with former Libyan dictator Muamar Qaddafi to let him resign as the country’s leader and handed over $500 million worth of weapons to al-Qaeda militants.